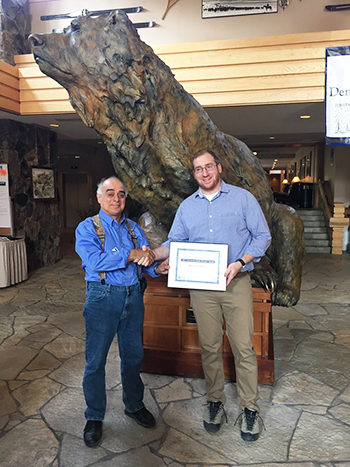 CHESS proudly congratulates Howie Joress on his win of the 2017 Denver X-ray Conference (DXC) Jerome B. Cohen award for outstanding achievements in student research in x-ray analysis. Joress is a PhD candidate in the Cornell Materials Science Department, and has been very active at CHESS since his arrival in the fall of 2012. His particular interest has been the study of fast processes in real time, especially chemical reactions and phase transitions in thin films, and he has co-authored over a dozen publications in this area. The award, which includes a $1,000 cash prize, recognizes Joress’s paper, “A Polycapillary Based Method Of Monochromatic Time-Resolved X-Ray Reflectivity.” Joress presented the paper at the 2017 DXC in Big Sky, Montana on August 3rd as part of the scientific program. The manuscript will also be published in the conference proceedings. Figure: Howard Joress receives the Jerome B. Cohen award from I. Cev Noyan during the DXC Plenary Session #dxc2017. (Tweeted from the ICDD twitter account @icddicdd at 11:51 AM August 3rd). Joress’s paper describes a new solution to a long-standing problem of studying thin films as they undergo structural of chemical changes in real time. In many cases, the best way to obtain this information is from a technique called x-ray reflectivity (XRR), but XRR typically requires that the sample and detector be moved during the measurement. This requirement places significant limitations on the time resolution of the technique, as well as its applicability to complex or bulky sample environments, such as a UHV chamber. The new approach uses a special optic, called a polycapillary, to create a fan of high intensity x-rays that strike and undergo mirror-like reflection from the sample over a range of angles. The strength of such reflections at different angles is strongly modulated by the structure of the thin film – and hence changes in this structure. Joress has successfully used this approach to monitor thin-film growth in real-time, as well as a phase-transition in a buried thin film of interest for solid oxide fuel cells. The approach both expands the range of problems to which real-time XRR can be applied, and is at the same time simpler and easier to implement than previous comparable techniques.